ISLAMABAD, Pakistan (CNN) -- Pakistan has urged India to scale back troop deployments along the countries' shared border in order to ease regional tensions following last month's massacre in the Indian city of Mumbai. 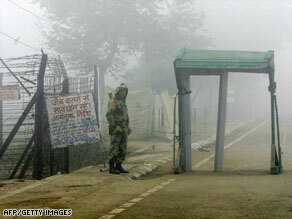 An Indian border guard stands on duty at the India-Pakistan Wagah Border Post crossing. Pakistan Foreign Minister Shah Mehmood Qureshi said in a statement made to state television Tuesday that India should withdraw its security forces to peacetime positions and deactivate air bases near the border. In return, Pakistan would pull back its troops as well, Qureshi added. But India's External Affairs Minister Pranab Mukherjee took issue, saying New Delhi hadn't done anything to escalate the situation between the nuclear-armed neighbors. "We have not escalated any tension between India and Pakistan, so where is the question of de-escalating it?" Mukherjee told reporters. An Indian army spokesman denied Saturday that any troop mobilization was taking place but told CNN that the army was watching the situation closely. But Pakistani authorities insist they have information to show Indian troop movements along the border. Reports on Friday that Pakistan had redeployed military resources on its eastern border with India raised concerns last week. An official in Pakistan's Foreign Office said Pakistani troop movements were in response to Indian troop movements and any scale back would follow the right signals from India. CNN National Security Analyst Peter Bergen said a Pakistani official told him 20,000 soldiers had been moved from the Afghanistan border toward the Indian border. That amount, he said, was not significant, as Pakistan has a very large army. Singh said no communication had been received from Pakistan about troop movements, but added that the Indian army was always on alert. India accuses Pakistan of harboring militant organizations and claims 10 attackers involved in last month's Mumbai attacks trained at a terrorist camp in the Pakistani-controlled part of Kashmir. Militants launched a coordinated strike against luxury hotels, a Jewish center and other targets in Mumbai beginning November 26, killing 160 people. Since the division of the subcontinent in 1947, India and Pakistan have fought three wars, including two over the disputed territory of Kashmir -- now wracked by an 18-year, bloody separatist campaign that authorities say has left at least 43,000 dead. There also was a limited border conflict in 1999 between the countries in Kashmir.